The ACER (Abrupt Climate Changes and Environmental Responses) global database includes 93 pollen records from the last glacial period (73–15 ka) plotted against a common chronology; 32 also provide charcoal records. The database allows for the reconstruction of the regional expression, vegetation and fire of past abrupt climate changes that are comparable to those expected in the 21st century. This work is a major contribution to understanding the processes behind rapid climate change. In this study we carried out a multiproxy high-resolution analysis on a sediment record from the Padul Basin in the Sierra Nevada (southern Iberian Peninsula). Padul is a classical and very unique site from the Mediterranean area as it contains a very long and continuous Quaternary sedimentary record. However, the uppermost part of the record was never recovered. In this study we focus on the last 4700 cal yr BP of Holocene climate variability and human activity in the Mediterranean area. At a bog site at Totes Moor in northwest Germany a layer of pine tree stumps at the fen–bog transition was exposed by peat mining. The lateral expansion of ombrotrophic bog between 6703 BC and 3403 BC was reconstructed using the locations and dendrochronological dates of the tree stumps. The spatial pattern relates to the elevation a.s.l. of the mineral base beneath the peat. The temporal distribution of bog expansion pulses relates to climatic variation. We reconstructed the minimum temperature for 505 years and found cold and warm periods, which correlate with reconstructed data for the Northern Hemisphere and neighboring territories. Our reconstructions are reflected in the fluctuations in ENSO, the short-term solar cycle, PDO, and the de Vries 200-year solar activity cycle. This is the first temperature reconstruction for this region and it is important for studying the climatic processes in the study region and in all of northeastern Asia. Knowledge of the past fire activity is a key for making sustainable management policies for forest ecosystems. A high-resolution macroscopic charcoal record from southwestern China reveals the postglacial fire history. Combined with the regional climate records and vegetation histories, it is concluded that fire was mainly controlled by climate before 4.3 ka and by combined action of climate and humans after 4.3 ka, and the relationship between fire activity and vegetation were also examined. This paper serves as a guide to high-quality pollen records in South America that capture environmental variability during the last 2 millennia. We identify the pollen records suitable for climate modelling and discuss their sensitivity to the spatial signature of climate modes. Furthermore, evidence for human land use in pollen records is useful for archaeological hypothesis testing and important in distinguishing natural from anthropogenically driven vegetation change. It has become a well-established paradigm that blanket bog landscapes in the British Isles are a result of forest clearance by early human populations. We provide a novel test of this hypothesis using results from bioclimatic modelling driven by cimate reconstructions compared with a database of peat initiation dates. Both results show similar patterns of peat initiation over time and space. This suggests that climate was the main driver of blanket bog inception and not human disturbance. High-resolution pollen analyses undertaken on two cores from southern France allow us to separate anthropogenic effects from climatic impacts on environments over the last 4500 years. A long-term aridification trend is highlighted during the late Holocene, and three superimposed arid events are recorded around 4400, 2600 and 1200cal BP coinciding in time with Bond events. Human influence on vegetation is attested since the Bronze Age and became dominant at the beginning of the High Middle Ages. Allen, J. R. M., Watts, W. A., McGee, E., and Huntley, B.: Holocene environmental variability – the record from Lago Grande di Monticchio, Italy, Quatern. Int., 88, 69–80, 2002. Attorre, F., Alfo', M., Sanctis, M. D., Francesconi, F., and Bruno, F.: Comparison of interpolation methods for mapping climatic and bioclimatic variables at regional scale, Int. J. Climatol., 27, 1825–1843, https://doi.org/10.1002/joc.1495, 2007. Attorre, F., Francesconi, F., Valenti, R., collalti, A., and Bruno, F.: Produzione di mappe climatiche e bioclimatiche mediante Universal Kriging con deriva esterna: teoria ed esempi per l'italia, Forest – Journal of Silviculture and Forest Ecology, 5, 8–19, 2008. Beffa, G., Pedrotta, T., Colombaroli, D., Henne, P. D., van Leeuwen, J. F. N., Süsstrunk, P., Kaltenrieder, P., Adolf, C., Vogel, H., Pasta, S., Anselmetti, F. S., Gobet, E., and Tinner, W.: Vegetation and fire history of coastal north-eastern Sardinia (Italy) under changing Holocene climates and land use, Veg. Hist. Archaeobot., 25, 271–289, https://doi.org/10.1007/s00334-015-0548-5, 2016. Behre, K.-E.: The interpretation of anthropogenic indicators in pollen diagrams, Pollen et spores, 23, 225–245, 1981. Ben Tiba, B.: Cinq millénaires d'histoire de la végétation à Djebel El Ghorra, CIFEG, Publ. Occas., Orléans, 1995. Bennett, K. D.: “psimpoll” and “pscomb”: C programs for analysing pollen data and plotting pollen diagrams (version 4.27), Queen's University Quaternary Geology program, available at: http://www.chrono.qub.ac.uk/psimpoll/psimpoll.html (last access: 20 July 2018), 2009. Benslimane, M., Hamimed, A., Zerey, W. E., Khaldi, A., and Mederbal, K.: Analyse et suivi du phénomène de la désertification en Algérie du nord, VertigO – la revue électronique en sciences de l'environnement, 8, 3, https://doi.org/10.4000/vertigo.6782, 2009. Bisculm, M., Colombaroli, D., Vescovi, E., van Leeuwen, J. F. N., Henne, P. D., Rothen, J., Procacci, G., Pasta, S., La Mantia, T., and Tinner, W.: Holocene vegetation and fire dynamics in the supra-mediterranean belt of the Nebrodi Mountains (Sicily, Italy), J. Quaternary Sci., 27, 687–698, https://doi.org/10.1002/jqs.2551, 2012. Branch, N. P.: Early–Middle Holocene vegetation history, climate change and human activities at Lago Riane (Ligurian Apennines, NW Italy), Veg. Hist. Archaeobot., 22, 315–334, https://doi.org/10.1007/s00334-012-0384-9, 2013. Burjachs, F., Pérez-Obiol, R., Picornell-Gelabert, L., Revelles, J., Servera-Vives, G., Expósito, I., and Yll, E.-I. : Overview of environmental changes and human colonization in the Balearic Islands (Western Mediterranean) and their impacts on vegetation composition during the Holocene, J. Archaeol. Sci., 12, 845–859, https://doi.org/10.1016/j.jasrep.2016.09.018, 2017. Calò, C., Henne, P. D., Curry, B., Magny, M., Vescovi, E., La Mantia, T., Pasta, S., Vannière, B., and Tinner, W.: Spatio-temporal patterns of Holocene environmental change in southern Sicily, Palaeogeogr. Palaeocl., 323–325, 110–122, https://doi.org/10.1016/j.palaeo.2012.01.038, 2012. Caroli, I. and Caldara, M.: Vegetation history of Lago Battaglia (eastern Gargano coast, Apulia, Italy) during the middle-late Holocene, Veg. Hist. Archaeobot., 16, 317–327, https://doi.org/10.1007/s00334-006-0045-y, 2007. Carrión, J. S., Fernández, S., González-Sampériz, P., Gil-Romera, G., Badal, E., Carrión-Marco, Y., López-Merino, L., López-Sáez, J. A., Fierro, E., and Burjachs, F.: Expected trends and surprises in the Lateglacial and Holocene vegetation history of the Iberian Peninsula and Balearic Islands, Rev. Palaeobot. Palyno., 162, 458–475, https://doi.org/10.1016/j.revpalbo.2009.12.007, 2010. Colombaroli, D., Marchetto, A., and Tinner, W.: Long-term interactions between Mediterranean climate, vegetation and fire regime at Lago di Massaciuccoli (Tuscany, Italy), J. Ecol., 95, 755–770, https://doi.org/10.1111/j.1365-2745.2007.01240.x, 2007. Cruise, G. M., Macphail, R. I., Linderholm, J., Maggi, R., and Marshall, P. D.: Lago di Bargone, Liguria, N Italy: a reconstruction of Holocene environmental and land-use history, Holocene, 19 987–1003, https://doi.org/10.1177/0959683609343142, 2009. Cullen, H. M., Hemming, S., Hemming, G., Brown, F. H., Guilderson, T., and Sirocko, F.: Climate change and the collapse of the Akkadian empire: Evidence from the deep sea, Geology, 28, 379–382, 2000. Currás, A., Ghilardi, M., Peche-Quilichini, K., Fagel, N., Vacchi, M., Delanghe, D., Dussouillez, P., Vella, C., Bontempi, J. M., and Ottaviani, J.-C.: Reconstructing past landscapes of the eastern plain of Corsica (NW Mediterranean) during the last 6000 years based on molluscan, sedimentological and palynological analyses, J. Archaeol. Sci., 12, 755–769, https://doi.org/10.1016/j.jasrep.2016.09.016, 2017. Curry, B., Henne, P. D., Mesquita-Joanes, F., Marrone, F., Pieri, V., La Mantia, T., Calò, C., and Tinner, W.: Holocene paleoclimate inferred from salinity histories of adjacent lakes in southwestern Sicily (Italy), Quaternary Sci. Rev., 150, 67–83, https://doi.org/10.1016/j.quascirev.2016.08.013, 2016. Di Rita, F.: A possible solar pacemaker for Holocene fluctuations of a salt-marsh in southern Italy, Quatern. Int., 288, 239–248, 2013. Di Rita, F. and Magri, D.: Holocene drought, deforestation and evergreen vegetation development in the central Mediterranean: a 5500 year record from Lago Alimini Piccolo, Apulia, southeast Italy, Holocene, 19, 295–306, https://doi.org/10.1177/0959683608100574, 2009. Di Rita, F. and Magri, D.: An overview of the Holocene vegetation history from the central Mediterranean coasts, Journal of Mediterranean Earth Sciences, 4, 35–52, 2012. Di Rita, F. and Melis, R. T.: The cultural landscape near the ancient city of Tharros (central West Sardinia): vegetation changes and human impact, J. Archaeol. Sci., 40, 4271–4282, https://doi.org/10.1016/j.jas.2013.06.027, 2013. Di Rita, F., Celant, A., and Magri, D.: Holocene environmental instability in the wetland north of the Tiber delta (Rome, Italy): sea-lake-man interactions, J. Paleolimnol., 44, 51–67, https://doi.org/10.1007/s10933-009-9385-9, 2010. Di Rita, F., Simone, O., Caldara, M., Gehrels, W. R., and Magri, D.: Holocene environmental changes in the coastal Tavoliere Plain (Apulia, southern Italy): A multiproxy approach, Palaeogeogr. Palaeocl., 310, 139–151, https://doi.org/10.1016/j.palaeo.2011.06.012, 2011. Di Rita, F., Celant, A., and Conati Barbaro, C.: Interazioni tra clima, ambiente e uomo nell'evoluzione olocenica del delta del Tevere: dati paleobotanici e ritrovamenti archeologici, Rendiconti Online della Società Geologica Italiana, 18, 19–23, 2012. 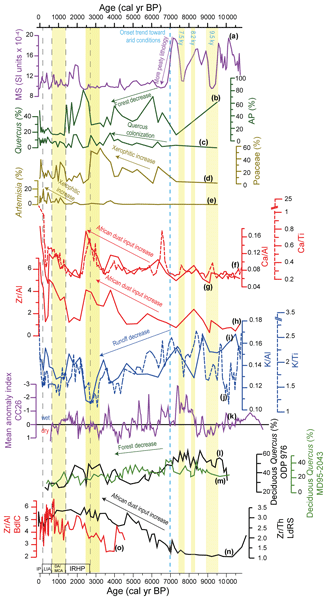 Di Rita, F., Celant, A., Milli, S., and Magri, D.: Late glacial–early Holocene vegetation history of the Tiber delta (Rome, Italy) under the influence of climate change and sea level rise, Rev. Palaeobot. Palyno., 218, 204–2016, https://doi.org/10.1016/j.revpalbo.2014.12.005, 2015. Di Rita, F., Fletcher, W. J., Aranbarri, J., Margaritelli, G., Lirer, F., and Magri, D.: Holocene forest dynamics in central and western Mediterranean: periodicity, spatio-temporal patterns and climate influence, Sci. Rep.-UK, 8, 8929, https://doi.org/10.1038/s41598-018-27056-2, 2018a. Di Rita, F., Lirer, F., Bonomo, S., Cascella, A., Ferraro, L., Florindo, F., Insinga, D. D., Lurcock, P. C., Margaritelli, G., Petrosino, P., Rettori, R., Vallefuoco, M., and Magri, D.: Late Holocene forest dynamics in the Gulf of Gaeta (central Mediterranean) in relation to NAO variability and human impact, Quaternary Sci. Rev., 179, 137–152, https://doi.org/10.1016/j.quascirev.2017.11.012, 2018b. Di Rita, F., Molisso, F., and Sacchi, M.: Late Holocene environmental dynamics, vegetation history, human impact, and climate change in the ancient Literna Palus (Lago Patria; Campania, Italy), Rev. Palaeobot. Palyno., 258, 48–61, https://doi.org/10.1016/j.revpalbo.2018.06.005, 2018c. Dixit, Y., Hodell, D. A., and Petrie, C. A.: Abrupt weakening of the summer monsoon in northwest India 4100 yr ago, Geology, 42, 339–342, https://doi.org/10.1130/G35236.1, 2014. Dixit, Y., Hodell, D. A., Giesche, A., Tandon, S. K., Gázquez, F., Saini, H. S., Skinner, L. C., Mujtaba, S. A. I., Pawar, V., Singh, R. N., and Petrie, C. A.: Intensified summer monsoon and the urbanization of Indus Civilization in northwest India, Sci. Rep.-UK, 8, https://doi.org/10.1038/s41598-018-22504-5, 2018. Drescher-Schneider, R., de Beaulieu, J.-L., Magny, M., Walter-Simonnet, A.-V., Bossuet, G., Millet, L., Brugiapaglia, E., and Drescher, A.: Vegetation history, climate and human impact over the last 15 000 years at Lago dell'Accesa (Tuscany, Central Italy), Veg. Hist. Archaeobot., 16, 279–299, https://doi.org/10.1007/s00334-006-0089-z, 2007. Guido, M. A., Menozzi, B. I., Bellini, C., Placereani, S., and Montanari, C.: A palynological contribution to the environmental archaeology of a Mediterranean mountain wetland (North West Apennines, Italy), Holocene, 23, 1517–1527, https://doi.org/10.1177/0959683613496294, 2013. 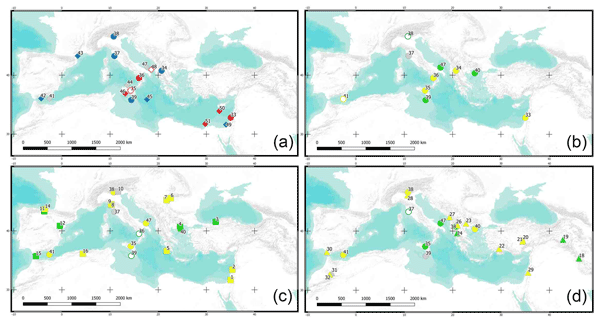 Joannin, S., Brugiapaglia, E., de Beaulieu, J.-L., Bernardo, L., Magny, M., Peyron, O., Goring, S., and Vannière, B.: Pollen-based reconstruction of Holocene vegetation and climate in southern Italy: the case of Lago Trifoglietti, Clim. Past, 8, 1973–1996, https://doi.org/10.5194/cp-8-1973-2012, 2012. Kaniewski, D., Marriner, N., Cheddadi, R., Guiot, J., and Van Campo, E.: The 4.2 ka BP event in the Levant, Clim. Past, 14, 1529–1542, https://doi.org/10.5194/cp-14-1529-2018, 2018. Lawson, I., Frogley, M., Bryant, C., Preece, R., and Tzedakis, P.: The Lateglacial and Holocene environmental history of the Ioannina basin, north-west Greece, Quaternary Sci. Rev., 23, 1599–1625, https://doi.org/10.1016/j.quascirev.2004.02.003, 2004. Liu, F. and Feng, Z.: A dramatic climatic transition at ∼4000 cal. yr BP and its cultural responses in Chinese cultural domains, Holocene, 22, 1181–1197, https://doi.org/10.1177/0959683612441839, 2012. López-Moreno, J. I., Vicente-Serrano, S. M., Morán-Tejeda, E., Lorenzo-Lacruz, J., Kenawy, A., and Beniston, M.: Effects of the North Atlantic Oscillation (NAO) on combined temperature and precipitation winter modes in the Mediterranean mountains: observed relationships and projections for the 21st century, Global Planet. Change, 77, 62–76, 2011. Magri, D.: Late-Quaternary changes of plant biomass as recorded by pollen-stratigraphical data: a discussion of the problem at Valle di Castiglione, Italy, Rev. Palaeobot. Palyno., 81, 313–325, 1994. Magri, D.: Some questions on the late-Holocene vegetation of Europe, Holocene, 5, 354–360, 1995. Magri, D.: Late Quaternary vegetation history at Lagaccione near Lago di Bolsena (central Italy), Rev. Palaeobot. Palyno., 106, 171–208, 1999. Magri, D. and Parra, I.: Late Quaternary western Mediterranean pollen records and African winds, Earth Planet. Sc. Lett., 200, 401–408, 2002. Magri, D. and Sadori, L.: Late Pleistocene and Holocene pollen stratigraphy at Lago di Vico, central Italy, Veg. Hist. Archaeobot., 8, 247–260, 1999. Magri, D., Agrillo, E., Di Rita, F., Furlanetto, G., Pini, R., Ravazzi, C., and Spada, F.: Holocene dynamics of tree taxa populations in Italy, Rev. Palaeobot. Palyno., 218, 267–284, https://doi.org/10.1016/j.revpalbo.2014.08.012, 2015. Magri, D., Di Rita, F., Aranbarri, J., Fletcher, W., and González-Sampériz, P.: Quaternary disappearance of tree taxa from Southern Europe: Timing and trends, Quaternary Sci. Rev., 163, 23–55, https://doi.org/10.1016/j.quascirev.2017.02.014, 2017. Margaritelli, G., Vallefuoco, M., Di Rita, F., Capotondi, L., Bellucci, L. G., Insinga, D. D., Petrosino, P., Bonomo, S., Cacho, I., Cascella, A., Ferraro, L., Florindo, F., Lubritto, C., Lurcock, P. C., Magri, D., Pelosi, N., Rettori, R., and Lirer, F.: Marine response to climate changes during the last five millennia in the central Mediterranean Sea, Global Planet. Change, 142, 53–72, https://doi.org/10.1016/j.gloplacha.2016.04.007, 2016. Mariotti Lippi, M. Florenzano, A., Rinaldi, R., Allevato, E., Arobba, D., Bacchetta, G., Bal, M.-C., Bandini Mazzanti, M., Benatti, A., Beneš, J., Bosi, G., Buonincontri, M., Caramiello, R., Castelletti, L., Castiglioni, E., Celant, A., Clò, E., Costantini, L., Di Pasquale, G., Di Rita, F., Fiorentino, G., Furlanetto, G., Giardini, M., Grillo, O., Guido, M., Herchenbach, M., Magri, D., Marchesini, M., Maritan, M., Marvelli, S., Masi, A., Miola, A., Montanari, C., Montecchi, M.C., Motella, S., Nisbet, R., Orrù, M., Peña Chocarro, L., Pepe, C., Perego, R., Rattighieri, E., Ravazzi, C., Rottoli, M., Rowan, E., Sabato, D., Sadori, L., Sarigu, M., Torri, P., Ucchesu, M., and Mercuri, A. M.: The Botanical Record of Archaeobotany Italian Network – BRAIN: a cooperative network, database and website, Flora Mediterranea, 28, 365–374,, https://doi.org/10.7320/FlMedit28.365, 2018. Marshall, M. H., Lamb, H. F., Huws, D., Davies, S. J., Bates, R., Bloemendal, J., Boyle, J., Leng, M. J., Umer, M., and Bryant, C.: Late Pleistocene and Holocene drought events at Lake Tana, the source of the Blue Nile, Global Planet. Change, 78, 147–161, https://doi.org/10.1016/j.gloplacha.2011.06.004, 2011. Martín-Puertas, C., Valero-Garcés, B. L., Pilar Mata, M., González-Sampériz, P., Bao, R., Moreno, A. and Stefanova, V.: Arid and humid phases in southern Spain during the last 4000 years: the Zoñar Lake record, Córdoba, Holocene, 18, 907–921, https://doi.org/10.1177/0959683608093533, 2008. Mercuri, A. M.: Genesis and evolution of the cultural landscape in central Mediterranean: the “where, when and how” through the palynological approach, Landscape Ecol., 29, 1799–1810, https://doi.org/10.1007/s10980-014-0093-0, 2014. Mercuri, A. M., Mazzanti, M. B., Torri, P., Vigliotti, L., Bosi, G., Florenzano, A., Olmi, L., and N'siala, I. M.: A marine/terrestrial integration for mid-late Holocene vegetation history and the development of the cultural landscape in the Po valley as a result of human impact and climate change, Veg. Hist. Archaeobot., 21, 353–372, https://doi.org/10.1007/s00334-012-0352-4, 2012. Natali, E. and Forgia, V.: The beginning of the Neolithic in Southern Italy and Sicily, Quatern. Int., 470, 253–269, https://doi.org/10.1016/j.quaint.2017.07.004, 2018. Noti, R., van Leeuwen, J. F. N., Colombaroli, D., Vescovi, E., Pasta, S., La Mantia, T., and Tinner, W.: Mid- and late-Holocene vegetation and fire history at Biviere di Gela, a coastal lake in southern Sicily, Italy, Veg. Hist. Archaeobot., 18, 371–387, https://doi.org/10.1007/s00334-009-0211-0, 2009. Oldfield, F., Asioli, A., Accorsi, C. A., Mercuri, A. M., Juggins, S., Langone, L., Rolph, T., Trincardi, F., Wolff, G., Gibbs, Z., Vigliotti, L., Frignani, M., van der Post, K., and Branch, N.: A high resolution late Holocene palaeo environmental record from the central Adriatic Sea, Quaternary Sci. Rev., 22, 319–342, 2003. Olsen, J., Anderson, N. J., and Knudsen, M. F.: Variability of the North Atlantic Oscillation over the past 5200 years, Nat. Geosci., 5, 808–812, 2012. Pinto, J. G., Ulbrich, U., Leckebusch, G. C., Spangeh, T., Reyers, M., and Zacharias, S.: Changes in storm track and cyclone activity in three SRES ensemble experiments with the ECHAM5/MPI-OM1 GCM, Clim. Dynam., 29, 195–210, 2007. Poher, Y.: Dynamique de la biodiversité et changements environnementaux en Corse depuis 7000 ans: éclairages paléoentomologiques et paléobotaniques, Biodiversité et Ecologie, Aix Marseille Université, 2017. Poher, Y., Ponel, P., Médail, F., Andrieu-Ponel, V., and Guiter, F.: Holocene environmental history of a small Mediterranean island in response to sea-level changes, climate and human impact, Palaeogeogr. Palaeocl., 465, 247–263, https://doi.org/10.1016/j.palaeo.2016.10.037, 2017. Radi, G. and Petrinelli Pannocchia, C.: The beginning of the Neolithic era in Central Italy, Quatern. Int., 470, 270–284, https://doi.org/10.1016/j.quaint.2017.06.063, 2018. Reille, M.: New pollen-analytical researches in Corsica: the problem of Quercus ilex L. and Erica arborea L., the origin of Pinus halepensis Miller forests, New Phytol., 122, 359–378, 1992. Reille, M., Gamisans, J., Andrieu-Ponel, V., and de Beaulieu, J.-L.: The Holocene at Lac de Creno, Corsica, France: a key site for the whole island, New Phytol., 141, 291–307, 1999. Sadori, L. and Narcisi, B.: The Postglacial record of environmental history from Lago di Pergusa, Sicily, Holocene, 11, 655–671, 2001. Smaoui, A.: Bioclimat et Végétation de la Tunisie et des régions prospectées pendant le 12ème ITER Mediterraneum de OPTIMA, Bocconea, 27, 13–20, https://doi.org/10.7320/Bocc27.1.013, 2015. Stambouli-Essassi, S., Roche, E., and Bouzid, S.: Evolution de la végétation et du climat dans le Nord-ouest de la Tunisie au cours des 40 derniers millénaires, Geo-Eco-Trop, 31, 171–214, 2007. Staubwasser, M., Sirocko, F., Grootes, P. M., and Segl, M.: Climate change at the 4.2 ka BP termination of the Indus valley civilization and Holocene south Asian monsoon variability, Geophys. Res. Lett., 30, https://doi.org/10.1029/2002GL016822, 2003. Tinner, W., Lotter, A. F., Ammann, B., Conedera, M., Hubschmid, P., van Leeuwen, J. F. N., and Wehrli, M.: Climatic change and contemporaneous land-use phases north and south of the Alps 2300 BC to 800 AD, Quaternary Sci. Rev., 22, 1447–1460, https://doi.org/10.1016/S0277-3791(03)00083-0, 2003. Tinner, W., van Leeuwen, J. F. N., Colombaroli, D., Vescovi, E., van der Knaap, W. O., Henne, P. D., Pasta, S., D'Angelo, S., and La Mantia, T.: Holocene environmental and climatic changes at Gorgo Basso, a coastal lake in southern Sicily, Italy, Quaternary Sci. Rev., 28, 1498–1510, https://doi.org/10.1016/j.quascirev.2009.02.001, 2009. Tinner, W., Vescovi, E., van Leeuwen, J. F. N., Colombaroli, D., Henne, P. D., Kaltenrieder, P., Morales-Molino, C., Beffa, G., Gnaegi, B., van der Knaap, W. O., La Mantia, T., and Pasta, S.: Holocene vegetation and fire history of the mountains of Northern Sicily (Italy), Veg. Hist. Archaeobot., 25, 499–519, https://doi.org/10.1007/s00334-016-0569-8, 2016. Trigo, I. F., Bigg, G. R., and Davies, T. D.: Climatology of cyclogenesis mechanisms in the Mediterranean, Mon. Weather Rev., 130, 549–569, 2002. Trigo, R. M., Pozo-Vázquez, D., Osborn, T. J., Castro-Díez, Y., Gámiz-Fortis, S., and Esteban-Parra, M. J.: North Atlantic oscillation influence on precipitation, river flow and water resources in the Iberian Peninsula, Int. J. Climatol., 24, 925–944, 2004. 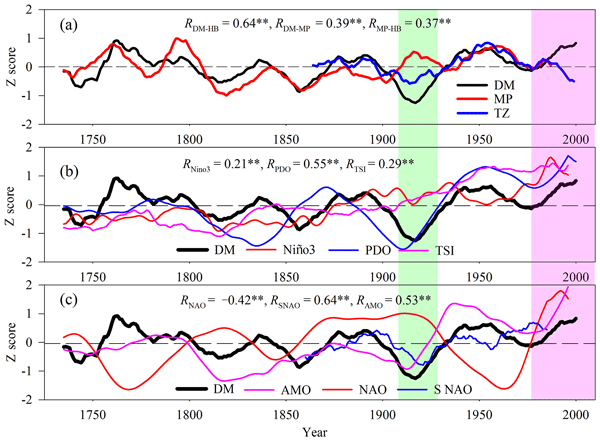 Trouet, V., Esper, J., Graham, N. E., Baker, A., Scourse, J. D., and Frank, D. C.: Persistent positive north Atlantic oscillation mode dominated the medieval climate anomaly, Science, 324, 78–80, 2009. Vannière, B., Colombaroli, D., Chapron, E., Leroux, A., Tinner, W., and Magny, M.: Climate versus human-driven fire regimes in Mediterranean landscapes: the Holocene record of Lago dell'Accesa (Tuscany, Italy), Quaternary Sci. Rev., 27, 1181–1196, https://doi.org/10.1016/j.quascirev.2008.02.011, 2008. Vescovi, E., Kaltenrieder, P., and Tinner, W.: Late-Glacial and Holocene vegetation history of Pavullo nel Frignano (Northern Apennines, Italy), Rev. Palaeobot. Palyno., 160, 32–45, https://doi.org/10.1016/j.revpalbo.2010.01.002, 2010a. Vescovi, E., Ammann, B., Ravazzi, C., and Tinner, W.: A new Late-glacial and Holocene record of vegetation and fire history from Lago del Greppo, northern Apennines, Italy, Veg. Hist. Archaeobot., 19, 219–233, https://doi.org/10.1007/s00334-010-0243-5, 2010b. Vicente-Serrano, S. M. and J. I. López-Moreno: The nonstationary influence of the North Atlantic Oscillation on European precipitation, J. Geophys. Res., 113, D20120 https://doi.org/10.1029/2008JD010382, 2008. Watson, C. S.: The vegetational history of the northern Apennines, Italy: information from three new sequences and a review of regional vegetational change, J. Biogeogr., 23, 805–841, 1996. Weiss, H.: 4.2 ka BP Megadrought and the Akkadian Collapse, Megadrought and Collapse: From Early Agriculture to Angkor, edited by: Weiss, H., University Press, Oxford, UK, 93–160, 2017. Weiss, H., Courty, M.-A., Wetterstrom, W., Guichard, F., Senior, L., Meadow, R., and Curnow, A.: The Genesis and Collapse of Third Millennium North Mesopotamian Civilization, Science, 261, 995–1004, https://doi.org/10.1126/science.261.5124.995, 1993. Yll, E.-I., Perez-Obiol, R., Pantaleon-Cano, J., and Roure, J. M.: Palynological evidence for climatic change and human activity during the Holocene on Minorca (Balearic Islands), Quaternary Res., 48, 339–347, 1997. Zielhofer, C., Fletcher, W. J., Mischke, S., De Batist, M., Campbell, J. F. E., Joannin S., Tjallingii, R., El Hamouti, N., Junginger, A., Stele. A., Bussmann, J., Schneider, B., Lauer, T., Spitzer, K., Strupler, M., Brachert, T., and Mikdad, A.: Atlantic forcing of Western Mediterranean winter rain minima during the last 12 000 years, Quaternary Sci. Rev., 157, 29–51, 2017. Zielhofer, C., Köhler, A., Mischke, S., Benkaddour, A., Mikdad, A., and Fletcher, W. J.: Western Mediterranean hydro-climatic consequences of Holocene iceberg advances (Bond events), Clim. Past Discuss., https://doi.org/10.5194/cp-2018-97, in review, 2018.